In 2018, disruption is certainly nothing new. We’ve seen it with the GAFAs (Google, Apple, Facebook and Amazon) as well as with companies such as Tesla and Uber—all of which have forced entire industries to change direction. Yet many insurers, despite investing increasing amounts each year, are still experiencing disruption and are susceptible to future disruption. Why aren’t insurers more prepared? The reasons vary, from unwarranted optimism about their current business models, to pressures on performance in the near-term, to a lack of tools to support strategic decision-making. But what I think it mostly comes down to is fear that disruption cannot be predicted and that the challenges it brings will be insurmountable. 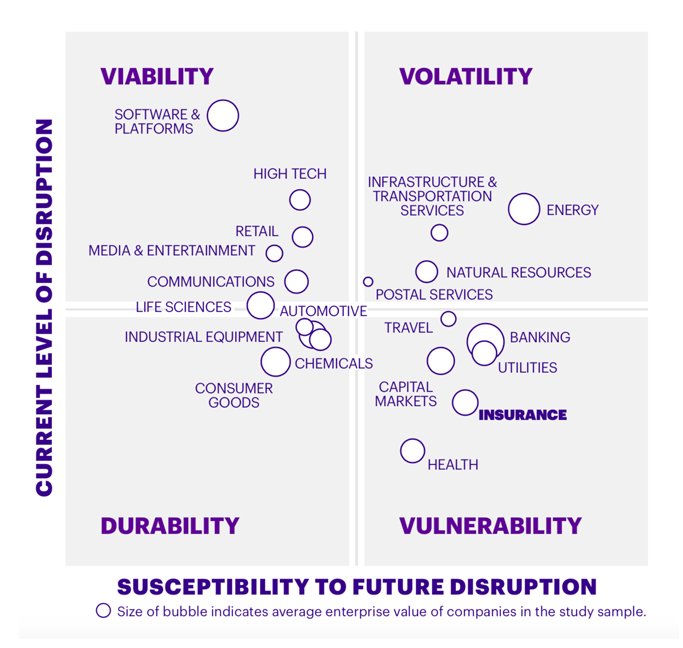 How does insurance rate on Accenture’s Disruptability Index? Current levels of disruption: the presence and penetration of disruptors, and incumbents’ financial performance. 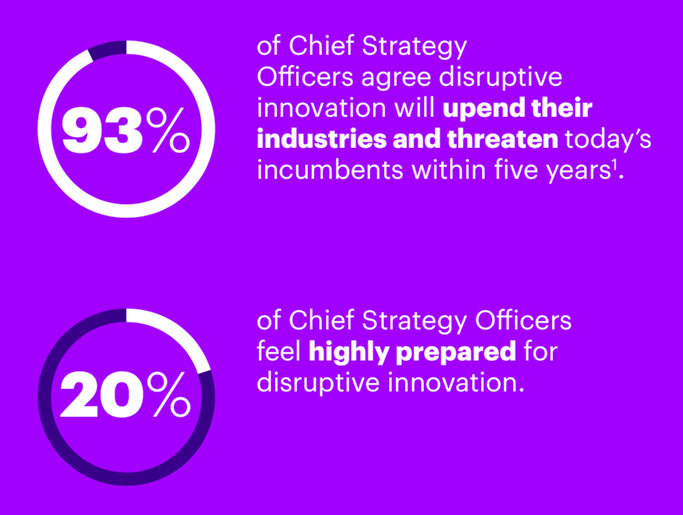 Susceptibility to disruption: the ability of incumbents to operate efficiently, their innovation activities and investments, and industry defenses and barriers to entry. According to our scorecard, insurance comes 19th out of 20 industries in terms of the current levels of disruption, but moves up to 4th out of 20 when it comes to susceptibility to future disruption. Durability. Low levels of both current disruption and susceptibility to future disruption. Industries such as industrial equipment, consumer goods and chemicals are in this quadrant. Viability. In this quadrant, industries such as media and entertainment, retail and high tech face high levels of current disruption, but lower levels of susceptibility to future disruption. Vulnerability. Facing low levels of current disruption, but higher susceptibility to future disruption, are industries such as health, capital markets, banking, utilities and insurance. Volatility. Industries such as natural resources and energy face high levels of both current disruption and susceptibility to future disruption. Why are insurers so vulnerable to future disruption? Weaknesses in operational efficiency and innovation. High labor and transaction intensity. Insufficient investments in advanced digital technologies. Low investor confidence in insurers’ future positioning. Low brand prominence, relatively high industry fragmentation and high levels of trapped value. Low revenue growth compared to other industries. Inefficiencies in the value chain. Recognizing these vulnerabilities puts insurers in a better position to meet the challenges of disruption. Those that overcome them will also be able to seize the opportunities disruption presents. In my next post, we’ll look at how the capabilities of a “living business” can help insurers seize disruptive opportunities. In the meantime, to learn more, check out the Taking Advantage of Disruption infographic. The claims processing department is particularly looking towards a major disruption in the insurance industry. Companies are incurring huge losses due to false claims and scams. Blockchain has already proposed solutions for this. Provenance is one major area where insurers can take advantage of blockchain. 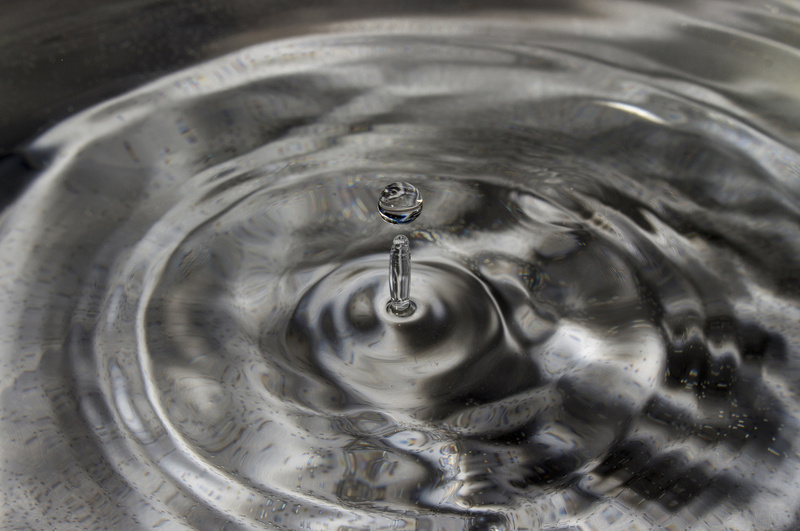 Another vulnerability – perhaps #1 in some products/markets – relates to the relatively poor standing of the industry in the eyes of its customers. In many cases, people only buy it because they have to, not because they want to, and in some products where their purchase is discretionary, there exists a serious problem of non consumption (e.g., life insurance in the US). This dissatisfaction is attractive to would be disruptors. Next Post - How can insurers seize the opportunities born of disruption? Suggested Post - How can insurers seize the opportunities born of disruption?